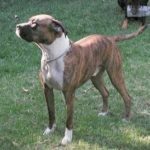 The Pitbull Boxer Mix (also known as the American Bullboxer, the Bullboxer Pit and the Pitoxer), is a very popular mix of two medium to large, powerful dogs: the American Pit Bull Terrier and the Boxer. This dog, if well socialized, is a joy to have around. 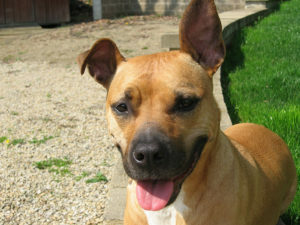 She has tons of energy; she’ll shower you with affection, and she shows an unwavering loyalty to her family. 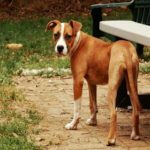 I’ve put together some information on this designer breed, so read on to see if the Pitbull Boxer Mix will be the one to win your heart and if you can be the owner she needs. 2. She needs plenty of exercise and lots of play! 3. Whatever the weather – not with this dog! It is very common for this breed to be a multi-generation cross, meaning that you may not get a 50/50 mix. If you buy from a reputable breeder, they should be able to provide details of the dog’s relatives. So your Pitbull Boxer Mix could have more attributes of one breed than the other, both in terms of physical appearance as well as character. 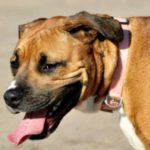 Given that both the Boxer and the Pitbull were bred for use as working dogs, these breeds are very energetic, so your Boxer Pitbull Mix requires a lot of exercise. If she doesn’t get enough, she can become hyper and frustrated, which will invariably lead to mischievous behavior such as chewing, barking and digging. 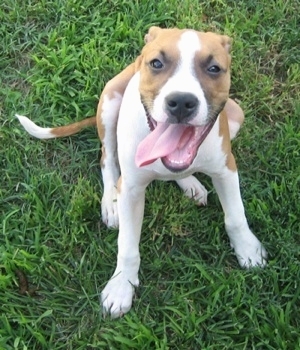 The Boxer Pitbull Mix is very playful and will need lots of toys at home. Careful, though! 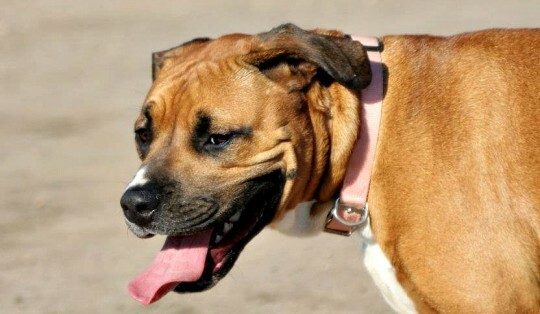 With her strong jaw and love of chewing, this dogs can destroy a chew toy within minutes. You’d better make sure it’s durable, otherwise you’ll be racking up a huge bill in no time. When you take her out, take a ball or a Frisbee to play fetch. She will love it! You should take her out for a brisk one-hour walktwice a day. If you are running, twenty minutes to half an hour should be enough. If your dog tires (you will notice her slowing or beginning to pant excessively) you should stop for a five-minute break and hydrate her. I recommend taking out a collapsible doggie bowl in which you can give her water. This advice on exercise applies to the adult dog only, as when large-breed puppies do too much running and ball-chasing this can cause long-term injuries. 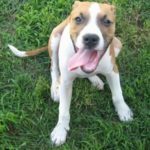 With your Pitbull Boxer Mix puppy, it is best to do lots of short walks and indoor play until she matures, at about 1 year – 16 months. Watch this 11 week old Pitbull Boxer Mix. She is curious, playful, active, and absolutely, jaw-droppingly gorgeous. These dogs are short haired and don’t possess a double coat, so they are sensitive to extreme weather conditions. If you live in a place where it gets to below-freezing temperatures, or it goes above 86 degrees (30ºC), I wouldn’t recommend this dog for you. In rainy weather, she will need a doggie coat to keep her warm. During summer months, it is best to take her out in the early morning or the evening when the sun is less intense. She may still need sunscreen, but make sure you purchase one without zinc oxide, as it is toxic for dogs. If you’re looking for a faithful and loving companion, look no further. 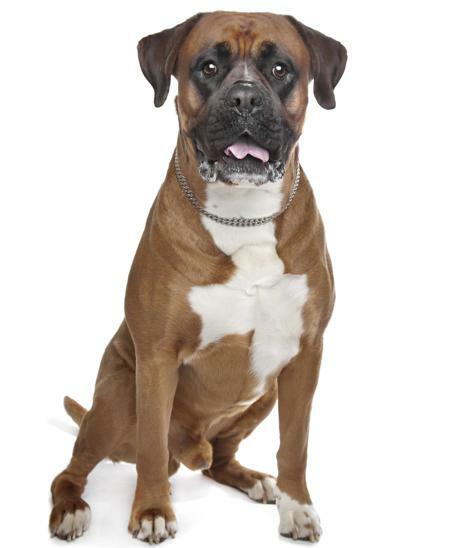 The Boxer is well known as a great companion dog who is incredibly people-orientated and likes to be close to its ´pack´. The Pitbull is also a very affectionate dog when well-socialized, who will lick you all over if you give her an inch. She was in fact bred for both work and companionship, and due to her gentle nature, is beginning to be used more and more as a therapy dog. 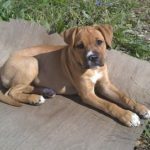 Both breeds are also great with children; the dog trainer Cesar Milan rates the Boxer and the Pitbull as excellent family dogs. 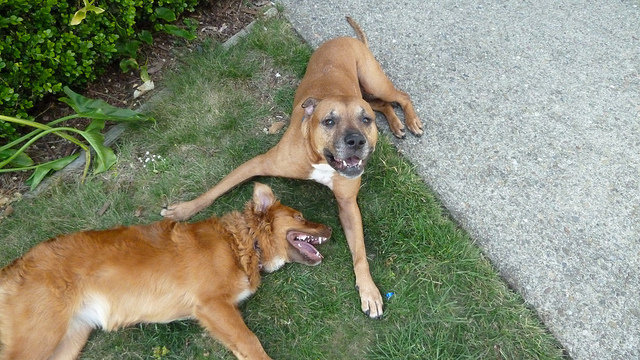 The Boxer is very patient and protective, while the Pitbull is solid, a people-pleaser and highly trainable. So mix them together and what have you got? 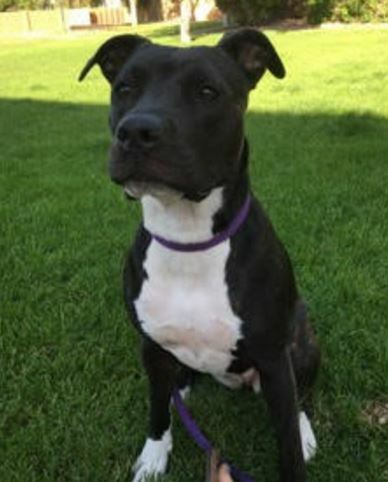 A companionable, affectionate dog who fits in perfectly with a family, wants a lot of attention and gives in return. It is, of course, worth noting that as puppies they are going to be more hyper, and so their contact with children must be supervised. Also, your dog must be well-exercised to be around children, as if not she will be incredibly excitable and could knock over a small child. 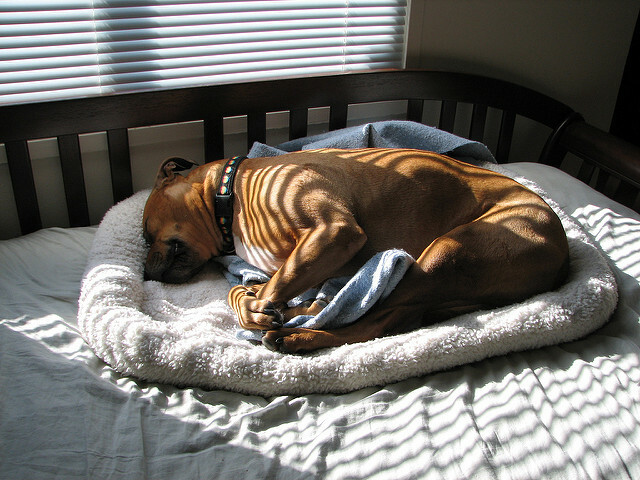 If she takes after her Boxer relatives, the Boxer Pitbull Mix can be incredibly protective. Her guard dog instinct is strong, which can be useful if there is an intruder or attacker. These are courageous dogs who used to risk their lives baiting bulls, so have no doubt that she will defend you and yours if necessary. If this instinct gets out of hand, however, it can become a problem. 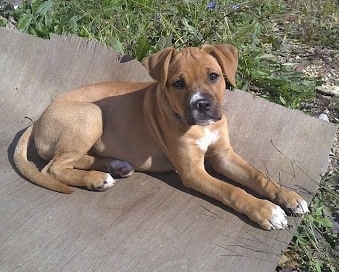 You must make sure that you socialize your Boxer Pitbull Mix from a young age with as many people as you can. Invite friends and neighbors to your home and provide her with a positive association by having the person give her a treat when they arrive. As long as you train her well and stay consistent, this dog will be the friendliest dog around. 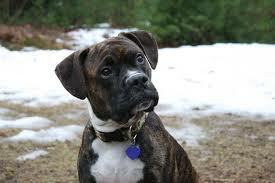 Providing they are both socialized properly, both breeds can get on well with other animals, particularly Boxers. 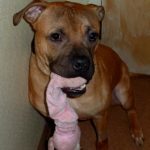 As for play style, Pitbulls can be rough and Boxers like to use their front paws when playing (much like a boxer… oh, that makes sense! ), so if you have any older dogs already, this crossbreed might be a bit much for them! These are intelligent dogs, which is no surprise, given that the Boxer is used in police and military work, as well as search and rescue. People are also beginning to look past the negative stigma around Pitbulls and realize their high intelligence and trainability, too. Director of Operations at Universal K9 claims that out of the hundreds of dogs he has trained for police work, the Pitbull, Kiah, is one of the top three he has ever placed. These dogs can be stubborn, though, meaning that you need to be firm and consistent with them. 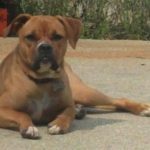 As long as you are in charge, your Boxer Pitbull Mix should pick up basic commands quickly. Make sure you do enough repetition and provide rewards and lots of praise. As puppies, they are boisterous and energetic little characters. You will need to be assertive in order to get their focus. Though these dogs have a short coat, they are moderate shedders and will require a good grooming session once a week. They will probably lose more fur in the Spring, from April through May, so it may be a good idea to brush her twice a week during these periods. Doing this will keep your dog’s skin and coat healthy, and the hairs out of your carpet! She will also need her ears checked monthly, either at the vet or with a reputable groomer. 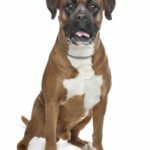 While the majority of Boxers are healthy, they are at risk of an aggressive form of cancer called hemangiosarcoma, which occurs in the blood vessel cells. It can be difficult to detect, but signs can include weakness, a distended abdomen, difficulty breathing and weight loss. If you notice any of these symptoms in your dog, talk to your veterinarian as soon as possible, as this cancer can spread rapidly. This condition consists of a malformation of the hip joint, where it is unstable or loose in the socket. 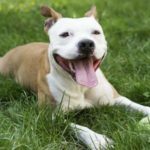 The Orthopedic Foundation for Animals shows that this condition occurs in both breeds, although Pitbulls are more susceptible. Severe cases can lead to arthritic joints and lameness. Signs can include walking or running with an altered gait and reluctance to fully extend their rear legs or jump. Weight control helps enormously with this condition; keep her slim, as any excess weight will put stress on her joints. 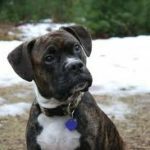 The Boxer is prone to a heart problem called aortic stenosis, which in most cases of the disease the dog is born with. This disease causes narrowing of the aortic valve, which puts pressure on the heart. Symptoms can include rapid breathing or difficulty breathing, sudden loss of consciousness and congestive heart failure. If your vet picks up a heart murmur, the diagnosis can be confirmed with an X-ray and a cardiac ultrasound. 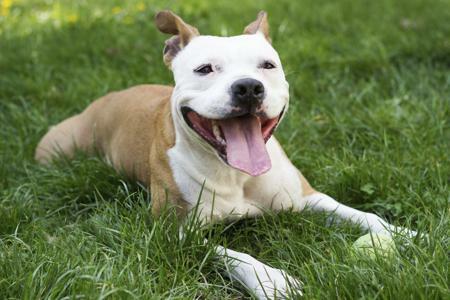 Pitbulls can have various allergies, so your Pitbull Boxer Mix may be susceptible. They can be treated with antihistamines, and in the case of skin irritation, you should use shampoos specifically designed for sensitive skin. Are you a family with children without any older pets? Are you ready to dedicate your days to plenty of exercise and play with your new lively companion? Can you give her the consistent training she needs? If the answer is yes to all of the above, you are more than ready to own a Pitbull Boxer Mix, and she will be more than happy to have you. If you’re in two minds, there are plenty of other dogs who could be the perfect fit for you, so keep looking! 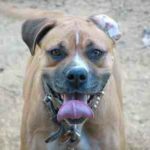 Have you got a Pitbull Boxer Mix and a story to share? Comment below! A deaf dog that looks like a 1-year-oldish white haired, blue eyed pit bull/boxer mix showed up on our porch swing the other morning when there was a -3 wind chill. Had her posted on the local shelter site but no takers. We have a 11-year-old Chihuahua and 8-year-old Yorkie so keeping the new dog inside is not possible. We took her to our vet, who told us that she looked like a pit bull/boxer mix, and said that we could keep her outside as long as we provide a warm shelter for her in the cold weather. For a temporary measure we put a cardboard box with lots of pillows and blankets (warmed in the dryer) on the porch swing. It has since warmed up into the 40-50 range. She appears to be happy running around outside and sleeping on the porch swing near the now chewed up box. We have ordered a dog house for her and are having her spayed tomorrow. We are a late middle-aged couple but I hope to be able to walk with her at least once a day. I hope you can wish us well for rescuing her. Would appreciate ideas of what kinds of toys would be appropriate for her to play with while she’s outside by herself as she has chewed up a quilted blanket, a towel and one of the cushions on the swing. For any aggressive chewers, I recommend the Kong and dogzilla products. They are made for the aggressive chewers. You can also hide treats inside which will engage their mind. Hope this helps. 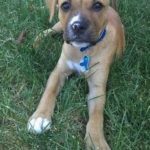 How is your pit boxer mix doing? Pitties can be a handful for the first year. But they are such extraordinary dog, so loving and wanting to do good that we only want pitties now. –Kong cone alone or better stuffed with treats like carrots, apples, part of her daily kebbles, coconut milk, coconut oil, 100% pumpkin filling, almonds, almond meal, flaxseed meal, chicken bits…..stuff your cone with any of those. Mix textures and find a good ratio of solid to liquid so you can freeze it and give it to her for play time, down time or when you leave the house. -old leashes or old collars that you disgarded or were already chewed on (cut out hooks, snaps…). The extra tough woven texture is ideal for pups and it massages her teeth and gums, plus it is a safe toy and inexpensive. –Himalayan woodblock for dogs to chew on like these. It very safe and extremely durable. Our dogs goes at it for hours, we have one we bought last summer on sale for $8 at Pet smart and it is still around!!!! -buy for nearly nothing at a yard sale, clean them and take off the laces. Give her those to her as well so you can save yours. -go to dog parks for extra socializing, play and workout. -provide her with every textures she seems to go for. Just substitute the “no no chews” (doors, shoes, pillows….with “good girl chews” as mentioned above and old things you don’t care about that are safe for her to chew on). Try to be creative so you don’t feel like your pet is more than you can handle. Social her as much as you can, with people, children, pets…. the more the meilleur. She is worth it and she will probably end up the best pet you ever had. Bring the poor thing inside!! She’s short haired, don’t you want a coat?! I certainly would. That KILLS me. She’s a smart and loving breed. They need love. And come on!!! My pit bull boxer mix sleeps with cats, arm over body, protector and lover. People like you who give that stigmatism screw it up by even writing that. Yuck. Give her away to someone who won’t give pit bulls the doubt. Disgusting. They were bred to be Americas number one breed in the 50’s back before ppl used them for fighting. It’s called loyal. Do your research. ED-U-CATE. Spread the word, don’t defy it. Get a toy that us made out of tire rubber,4 example, there r ones that have a middle if it put peanut butter in it,,should b entertained. 4 hrs,If u live in the Havlock area, Um a veterinarian,I would love to help, profit nonprofit org. I have what I believe to be pitbull boxer mix. She was found in the Bronx streets starving skin and bones. We’ve nursed her back to health and is such a beautiful dog. High maintenance but worth it. 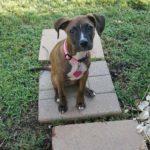 I foster dogs and she is available for adoption. She is so appreciative for food shelter and companionship. It breaks my heart to think she was days from death. She is a special dog with special story andf deserves special adopter. We just got one on Christmas Eve. She is 9 weeks old now. (Mia) Can’t wait to get her outside!! Our last puppy died of Parvo which according to the vet she got it at 4-5 weeks (never had a chance) so I am taking extra precautions this time. No outside till shots are done. We have two cats….one of which plays with her (supervised of course) but so far all is well. Thanks for the encouragement! 🙂 Future is looking bright! I hope this isn’t to nosy,but where are you all from. My girl is about the same age as yours,but I got her from some random people of of Craigslist. Craigslist find made me a little worried, but she’s proven to be an absolute gem. I’m kind of curious to find out more about her family. We are in Central Florida. Also, she’s a “Mel” too, but she’s Melody instead of Melissa. Haha 🙂 Nice Carolyn, thanks for sharing. I have an 11 1/2 month old brindle pitbull/ boxer. I jus love her. We got her when she was 4 months old. Great family dog, phenomenal with all 3 of my boys, 11yrs old, 3 yr old, and 18 month old. She loves fetching the tennis ball(NOTE FROM EDITOR: Purchase from Amazon here). Full of energy! Shes my bisha boo!! Growing up ive had a boxer and pitbull , and with her being mixed..best of both worlds. Highly recommend one. 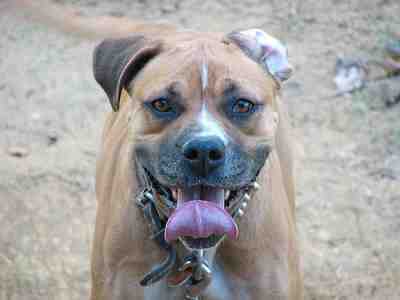 we have a pitbull boxer mix maybe 3 yrs old. got her from the boxer rescue. we also rescued a boxer male about 2 yrs old. 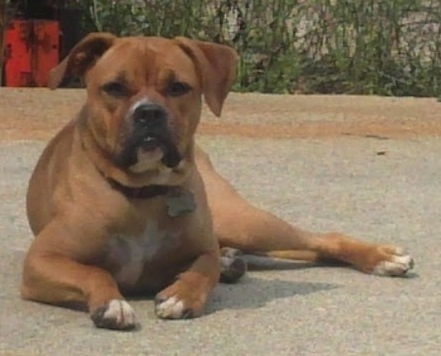 the boxer pitbull mix (female) plays great with the boxer ( male) she has always been a little bit bossy with him. but plays well together. gradually she has gotten more aggressive with him ,especially when my husband and i are around them , like she does not want him around us. we do not like this behavior in her. any suggestions out there , she has started to attack him and aggressively fight . We got our pit bull boxer at age 1 she is now a little over 3. She cannot be around other dogs or animals at all. She is very protective of our family and her home. She is a great family dog. We do not allow her around other animals because of this if you are a squirrel ,dog,cat ,or raccoon in the yard look out she will eat you! I know this is why she had 3 homes before she became ours. We have never been able to break her of this attitude with other animals, she is great with people! Good luck. 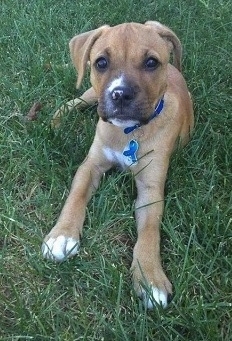 I have a pitbull/boxer mix puppy who is now 14 weeks old. I brought him home when he was six weeks, and he stole my heart the very first day! He earned the name Crash by that first evening, because that’s what He did; he crashed through things and over things and under things lol… He is playful with tons of energy, and he’s also sweet and cuddly. He has even won over our 14 year old pitbull and has him playing just like he was a puppy again himself. Definitely happy with our newest addition to the family!!! I have a bull boxer puppy named Piper. I rescued her when she was about 3months. There was a history of deliberate abuse with her and it has taken 6 months to be able to reach for her and have her respond without fear. I have two seniors so it takes lots of interference from me during play. My yellow lab has adopted her and body blocks her from any perceived danger. She is delightful but a real handful as a puppy. My boxer/pit brindle bundle of joy joined our family last July. 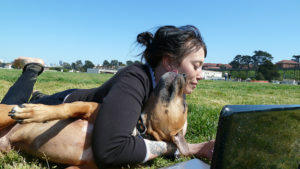 The shelter was going to euthanize all bully breeds because of crowded conditions. I took off my cast (broken ankle) and drove 45 miles to rescue the best dog ever. 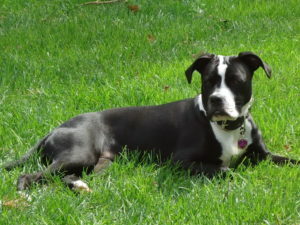 Her markings were almost identical to my pit bull that passed in December from bone cancer. She submits to my 9 lb. chiweenie terror and loves the cat. We have a Pitbull/Boxer mix named Deuce who we adopted from a local animal shelter called Saving Grace. He is about four months old right now and an amazingly smart and loving little guy. Our three kids have been working on training him and it took hardly any time whatsoever. After about a month, he is almost fully potty trained to go only outdoors. After having him home for about a week, he was able to follow and obey the commands “come,” “stay,” “sit,” my daughter taught him “high five,” where he puts a paw up to meet your hand, and my son taught him “bang!” where he drops to the ground and rolls over on his back playing dead. It’s so freakin adorable. I’ve never had a more intelligent dog before. Of course, lots of healthy treats have aided the process, as he is highly food motivated. He also enjoys his Kong (NOTE FROM EDITOR: Purchase from Amazon here), which we fill with peanut butter and freeze overnight. The extra measure of freezing it provides more relief for his discomfort while teething, and also provides more mental stimulation because he has to work harder to get the peanut butter. Despite all of the expensive, good quality toys we have purchased for him, he prefers old, used stuffed animals, cardboard boxes, and large sticks out in the backyard. He has also learned to fetch, retrieve, and return a ball and a frisbee (with treat rewards). He loves being outdoors more than just about anything. He is cautious and careful around our elderly cat. He gets really excited to see the cat because he wants to play, but the cat doesn’t want any part of that. So Deuce will run wide circles around the cat and/or get really low on the ground an inch his way towards the cat, but definitely stays out of his protective cat Bubble. A favorite story of mine so far has been from when I was teaching him to fetch the ball and return. I would throw the tennis ball a short distance, he’d run after it and pick it up in his mouth and return it, and then drop it at my feet. I would immediately reward him with a small treat and then we’d do it all over again. One time while he was eating his treat, I was looking around the yard, lost in thought. Apparently he was ready to fetch again and I wasn’t fast enough. He barked once, which got my attention so I looked back down at him at my feet. As soon as we made eye contact, he picked the ball up himself, ran with the ball in his mouth over to the spot where I was throwing it, dropped it in front of himself, picked it right back up, ran back to me, and dropped it at my feet. He got a “jackpot” reward for that cute little stunt! Love this dog, but he definitely needs a lot of exercise, play, water, and attention. We are going to have to step up our game because he is beginning to get bored at certain parts of the day when not receiving attention, and doing behaviors like loud barking, chewing things that are not toys, and getting too aggressive with play, like lunging towards us and trying to put peoples hands in his mouth. Otherwise, all-around wonderful dog and perfect fit for our family. I have a 3 year old female. I bought her from a low income shelter and fell in love with her right away. Unfortunately, I didn’t really know what I was getting into and in the first week, she ate through all of her toys, my couch cushions, my pillow, and 3 pairs of shoes. With lots of work, training, and exercise, she is now a completely different dog. She only chews her toys and is fine being left out of her kennel while I’m away. I do sguest that if you do decide on this mix of dog that you crate train and stay active. While I have personally never had any issues with her attacking other animals, her prey drive is pretty strong and I have had to incorporate changing her focus from the stimulus in her training. These dogs are like most other dogs where if you know what you’re doing, or seek help if you don’t, they make wonderful companions. I’ve always grown up around small dogs but I’ve always loved pits and bigger dogs. I just turned 18 and graduated and decided what better time to get me a little baby of my own and learn some responsibility? I looked around for months for a puppy and finally one of my friends found me a litter they were selling for 120 each. Best 120 I’ve ever spent. I picked out a boxer/ pit mix brindle male and couldn’t have made a better choice. 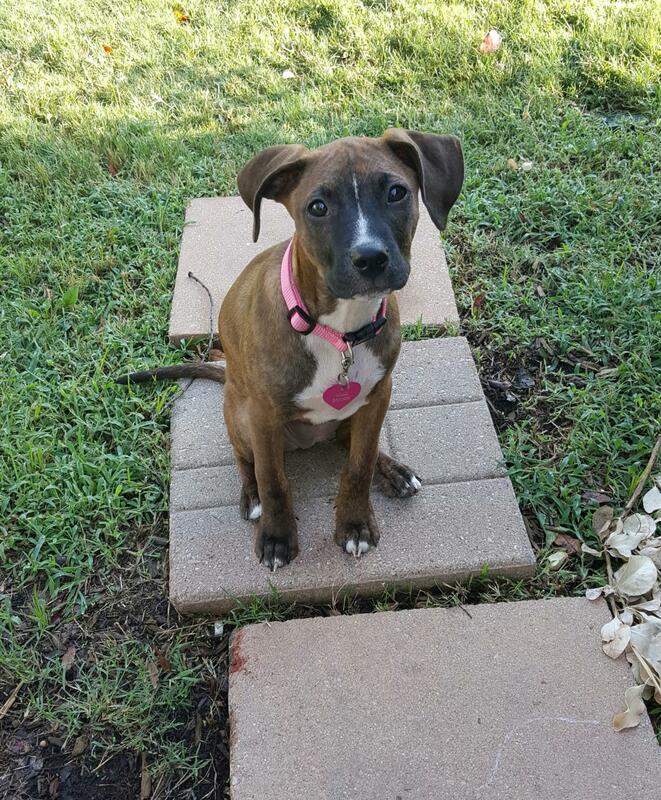 October 2016 I rescued what her papers say is a Boxer Lab mix. I recently have come to believe she is a Pit Boxer. Around 4 years old. She is the sweetest girl ever! Very sociable with people and does well with certain dogs at occasional daycare. I am a moderately active 65 year old and I take her for regular walks but think she needs more. Gets a robust run in good size fenced in yard 3-4 times a week when she hears deer in forest outside our fence. Lease laws highly enforced in HOA and park so free runs are limited. We spend lots of cuddle time. Any recommendations to give her the best life possible? 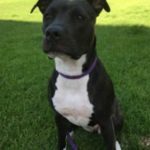 Miko is my 6-year old Pit/Boxer mix, a black and white tuxedo girl. I’ve had her since she was 12 weeks old. The description of her breed is exactly her. She is a good girl. I’ve had to work with her and train her since puppyhood, along with the help of her surrogate brown nose pit bull mom, Jada, but it has been worth it. She can get overly excited but does listen. I show her lots of love and let her know when she has misbehaved. I feel bad I leave Miko during the day to go to work. But she does have a gated yard to run around in, two dog houses and toys. She loves to bark & growl at people walking by…scares the heck out of them sometimes when she quietly saunters up behind them on the other side of the gate! I just got a second Bullboxer. Her name is “Nyx” .. and at almost 8 weeks old.. she is a little goof ball. I have already fallen for her. And my parents Love her as well..
my boys come over and rough house with the pair of them, and they absolutely love the attention. And being in a wheelchair for the last 24 yrs it makes it a little hard for me to exercise them in the same fashion. So it’s a godsend that my boys come over and play with the girls. Clio is so patient with Nyx (especially since there is a 3 yr age difference. And it looks like she is starting to become the big sister that I was hoping her to be for Nyx as well. She watches over Nyx in the backyard when its “potty” or “Play time” so I don’t have to go outside in the evening chill all the time. I’ve owned mix breeds and Full breeds of Rotties, Bernards, Sharpee’s, And Labs. I’m new to the pit boxer owner family. 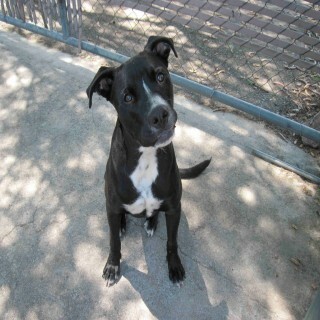 In fact I found this site doing some research on our 5 month old addition Major. He is a love ball of crazy but we love him. Nobody was prepared for the amount of affection he had to give,but we quickly learned. When I got him 2 months ago he had a broken leg and tail. I had to give a lot of hands on care that has made him quite and attached . I’m looking for a way to brake this without him ever feeling abandoned. This is his forever home. Rescued my Jackson in 2009, when my husband had passed away. He was 1 1/2 already and already trained, so I didn’t even have to housebreak him. Wow! I did not realize the energy boxers have! I love exercise anyway, so we usually take a daily walk. This winter has been so brutal, I have been throwing his ball inside, but his hips seem to bother him, whether he lays around too much ( my fault) or goes up and down the stairs after the ball. He will be 10 1/5 this May. Hope he has a few years left? Why no older pets? We have a nine year old Miniature Schnauzer male that seems a bit depressed after us losing our second dog to illness. We are looking for a puppy. However do not want him to be a threat to each other. I adopted a Pitt/boxer mix in Sept from Florida. He is 6 survivor 2times of cancer and had his eardrums removed in Feb. He has been receiving dog food from chewy which started grain free. He stopped eating it even with mixers. Ordered chicken and brown rice still won’t eat so we got beef and brown rice . Nothing. Even mixing the food adding mixers or graveyard. He has to eat. Also he has severe separation anxiety and an extreme cat aggression . Since he’s deaf I’m having a hard time training him. He’s so smart and my whole world I just need help. Thanksgiving 2017 so she’s 8 weeks…..we have a 4yr old terrier mix for right now (planning to give him away). I need all the tips I can get to make sure me and this beautiful sweet baby succeed. I have a cat, is this going to be a problem if I get a puppy?? I have recently adopted a 1yr old male brindle pitoxer and am absolutely in love! 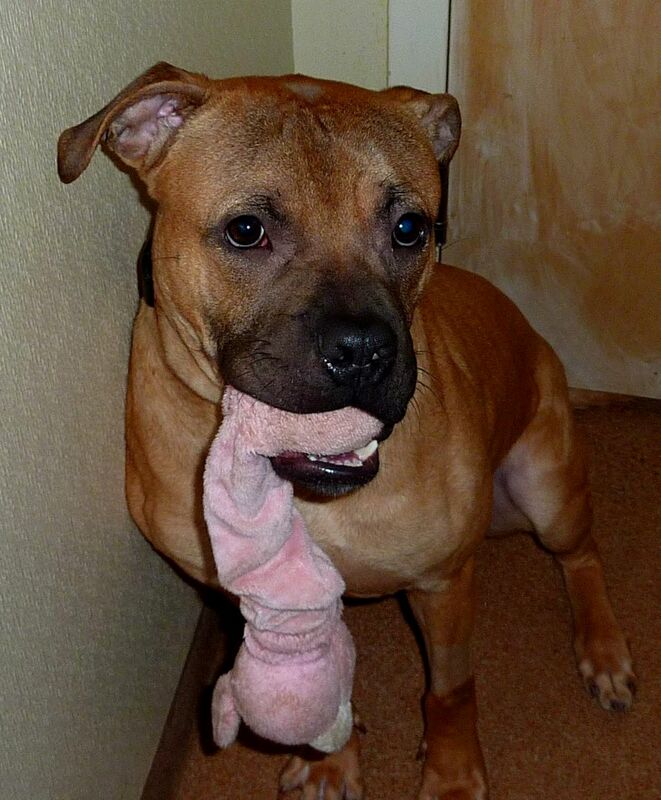 We have lots of nylabone, Kong and antler toys and this keeps him from chewing other not so good or wanted items. He is a warm, sensitive loving boy with a crap ton of energy! A 2 mile hike in the woods doesn’t even tire him out! He loves everyone in the home and whoever comes to visit like they are members of his pack and lets them know his feelings by picking one of his toys and laying all over them to chew, lol! One of the best things in training him and socialization is that he ADORES ice cubes! He will play with them and slide them around with his face or even likes to “Bob” for them in his water dish, ha! A year and a half ago I had to put down my wonderful pit who was the “baby” of the family and it took me a long time to recover from that loss. Having said that, “Chewie” has filled that hole in my heart plus some and I am so excited for all of our upcoming adventures and memories! Love love love my Chewie! 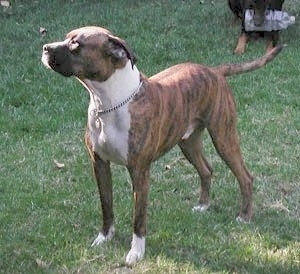 Our pit/boxer (Baby) is 11 uears old, she is the best dog (family member) we jave ever had. She is swert, kind, gentle and so smart. My 86 year old Dad came to live with us and these two are best friends.